In a medium bowl, combine the ground turkey, parsley, grill seasoning, mustard and poultry seasoning. Form four patties. Using your thumb, make an indentation in the center of each to prevent bulging while cooking. Wash your hands after handling the raw poultry. In a large nonstick skillet, heat the EVOO over medium-high heat. Add the patties and cook until the juices run clear, 6-7 minutes on each side. During the last few minutes of cooking, top each burger with a cheddar slice, tenting loosely with foil to melt the cheese. Meanwhile, in a small bowl, combine the zucchini, bell pepper, red onion, thyme, hot sauce and lime juice. Season with salt. Toast and butter the English muffins. Set a lettuce leaf and burger on each muffin bottom and top with some zucchini relish and a muffin top. In Recipes-list.com we have selected the most viewed recipes from category - uncategorized . Enjoy the best recipes specially selected for you! 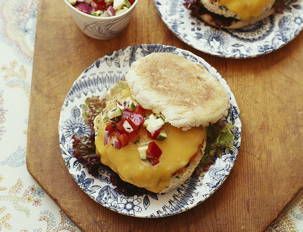 Turkey Burgers with Zucchini Relish is the right choice that will satisfy all your claims.